« Jeepers. It’s the Creeper! 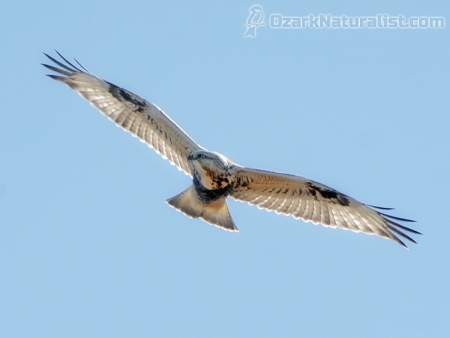 Day 2 of the Great Oklahoma Rough-Legged Hawk Expedition got off to an inauspicious start when we overslept by an hour. The only thing that really cost us though, was seeing the police arrest the “crazy woman” in the lobby, at least according to the desk clerk. I’m sorry we missed it; a little excitement to start the day is always nice. We left the hotel, headed to IHOP for a quick breakfast. The ground was wet from the rain that had fallen during the night, but it was now clear and cloudless. And even more importantly, there was but a gentle breeze stirring the air, yesterday’s tempest a distant memory. We were off to a good start and ready to roll. Until Brock turned green. I don’t know if it was something he had eaten (like the slightly dead cow and barnyard weeds he’d had at dinner the night before) or if he had picked up a microscopic hitchhiker. Either way, he didn’t look very healthy and kept telling me he was gonna hurl. But he sucked it up (not literally—get that image out of your head) and soldiered on. 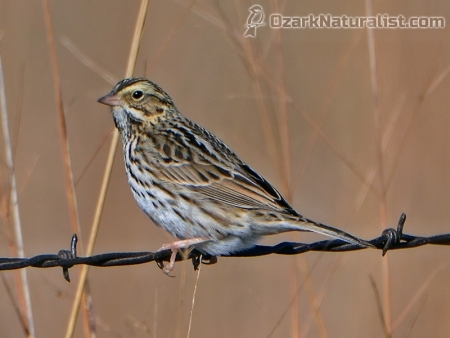 We decided to bypass the Tallgrass Preserve and work the area to the west and north instead. So it was west on Hwy 60 until we reached the Osage Wind Farm, then north on Hwy 18 through Shidler. A few miles north of Shidler we planned to use a network of county roads to head east to Foraker, then north and west to Grainola, back on Hwy 18 a little short of the Kansas line. I’m not sure what to make of the wind farm, at least a hundred of those massive turbines spread over 8400 acres. I know they produce clean energy, but I wonder what it costs in bird lives. I know we saw zero hawks while we were near the turbines and maybe that wasn’t a coincidence. But I digress. 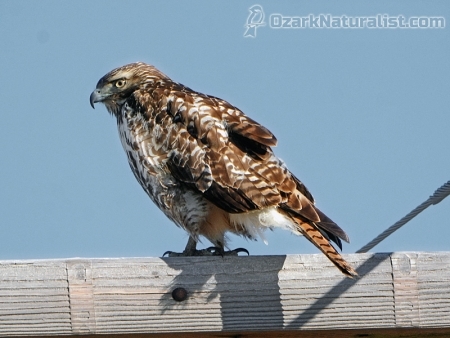 We almost immediately began seeing hawks once we had left Pawhuska, though they were Red-tails instead of Rough-legs (“Red-tails and Rough-legs” has to be the name of a country song.) 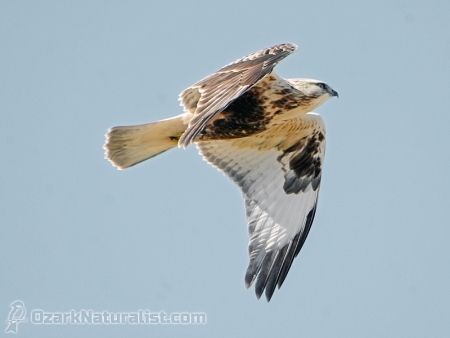 Like most Red-tails, many of them would take off if we even thought of stopping, but I did get a few photos. This heavily marked beauty stayed put for a few seconds and let me grab a few frames. I’m not sure if he’s a Harlan’s or a dark morph of one of the other races. Apparently, this area of Oklahoma is a melting pot of the different races during the winter, so neither would be a surprise. We didn’t see much from the wind farm until we got on the county road between Hwy 18 and Foraker. 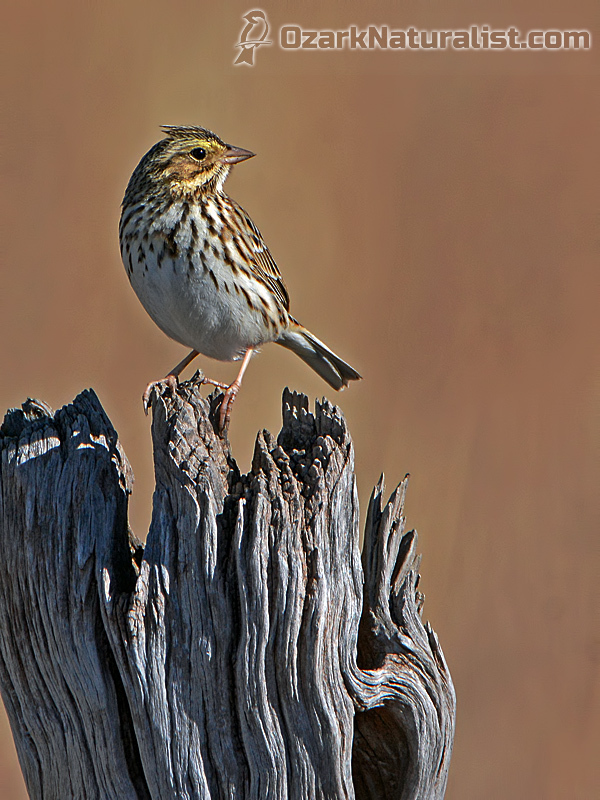 Savannah Sparrows were everywhere now that the wind was no longer forcing them to cover and I photographed them until I grew a little bored. Shortly before you reach Foraker, there was a large horse ranch on the north side of the road. I swear there were horses of any color you could imagine; If there weren’t at least 200 horses in view, I’ll kiss your big toe. Someone has a lot of money running around that field. Stopped in the road staring at the horses, one of us finally realized there was a hawk hover hunting in the distance. He was the first Rough-leg of the day. 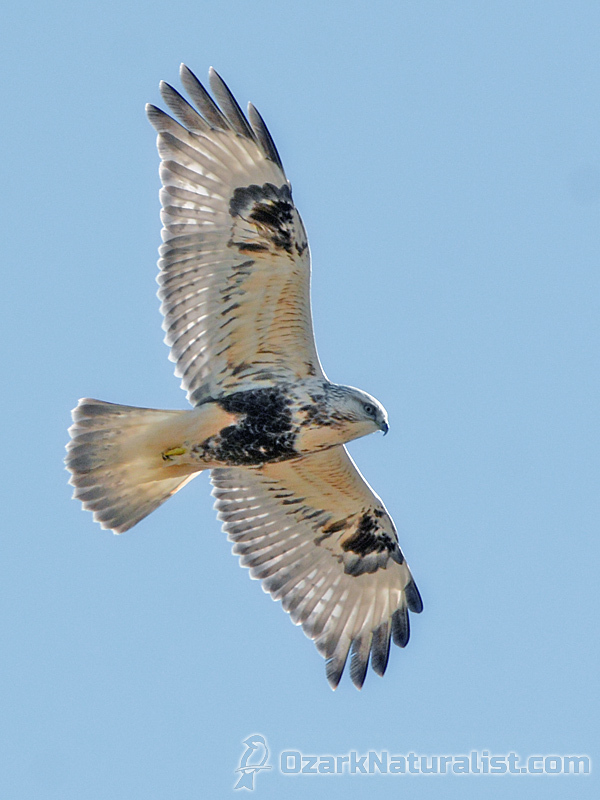 Kind enough to move closer to the road, he even banked briefly, showing off his underwing markings. 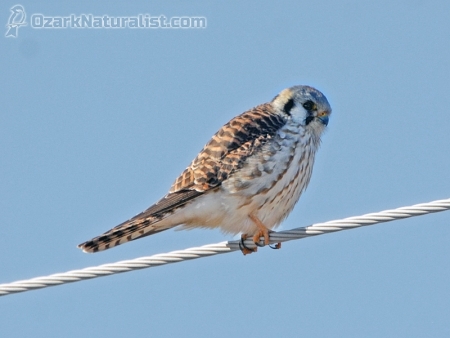 Unlike most raptors, Rough-legs can be aged and sexed by differences in plumages. 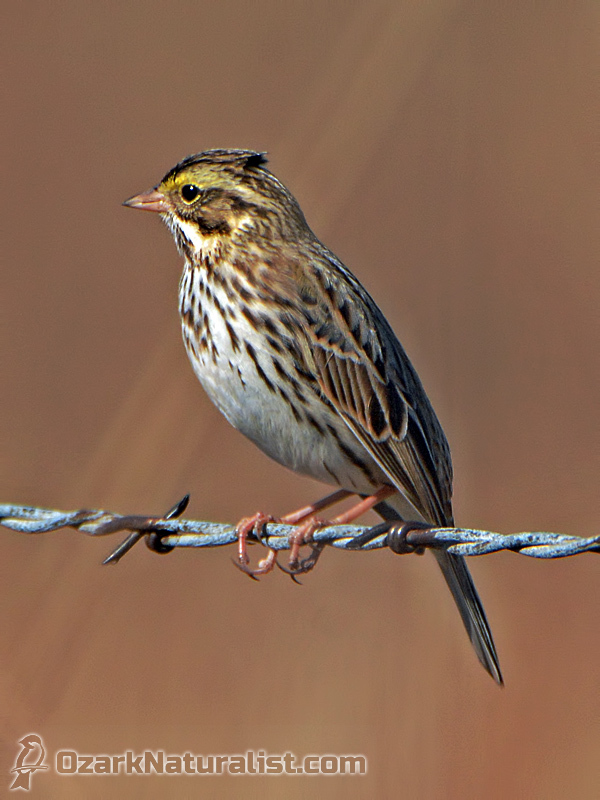 This bird lacks a well-defined, dark belly marking, and has more than 1 tail band, markings diagnostic of an adult male. Go here for a good write-up on distinguishing all the different variations of sexes, ages and color morphs. The bird drifted off to the north and we started to leave. Then a distant speck appeared in the sky on the south side of the road, resolving itself into another hover-hunting bird. Then another appeared, and finally a third, all in view at the same time. 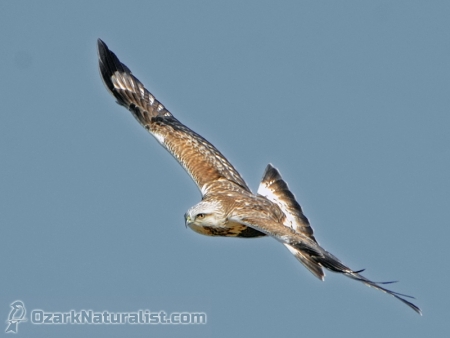 We watched them for a while, but all were too distant to photograph and moving away besides. They wouldn’t have made good photo subjects anyway, backlit strongly by the winter sun. We passed through Foraker, then turned to the north for a few miles. There were many more Savannah Sparrows (though curiously, no other sparrow species,) several Northern Harriers and an American Kestrel. and it’s crap too. 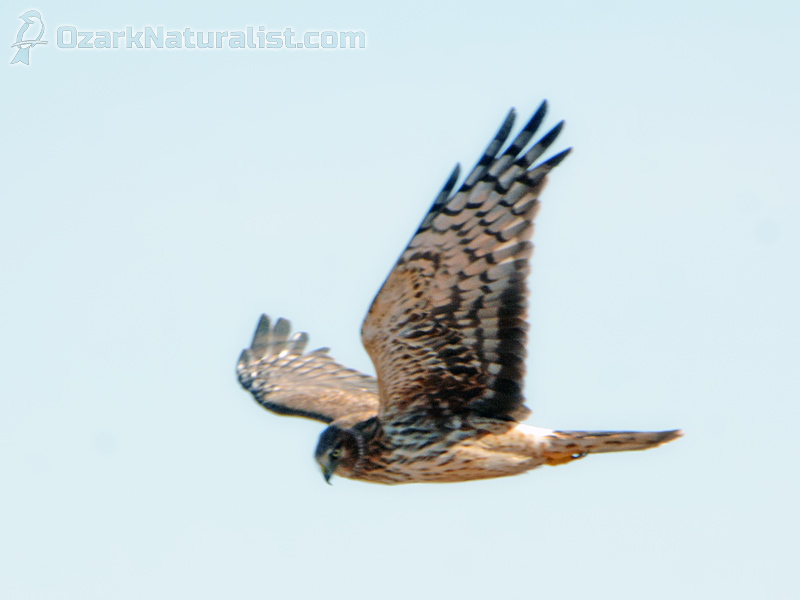 I consider Harriers a nemesis bird—I see them all the time, but I don’t think I’ve ever gotten a halfway decent shot. Eventually, we reached the county road that led back to the west and Hwy 18. 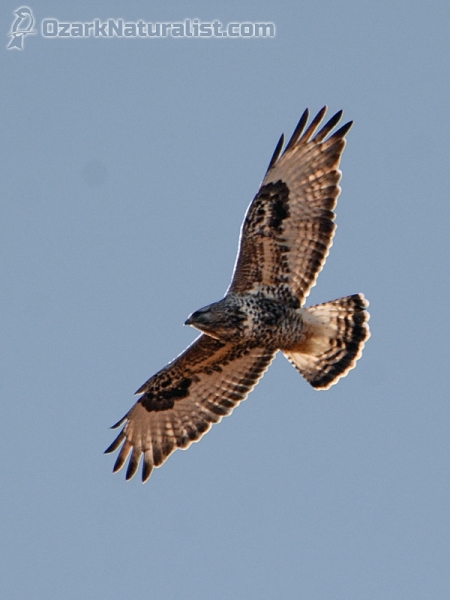 More Harriers, Red-tails and Savannah Sparrows kept us company. 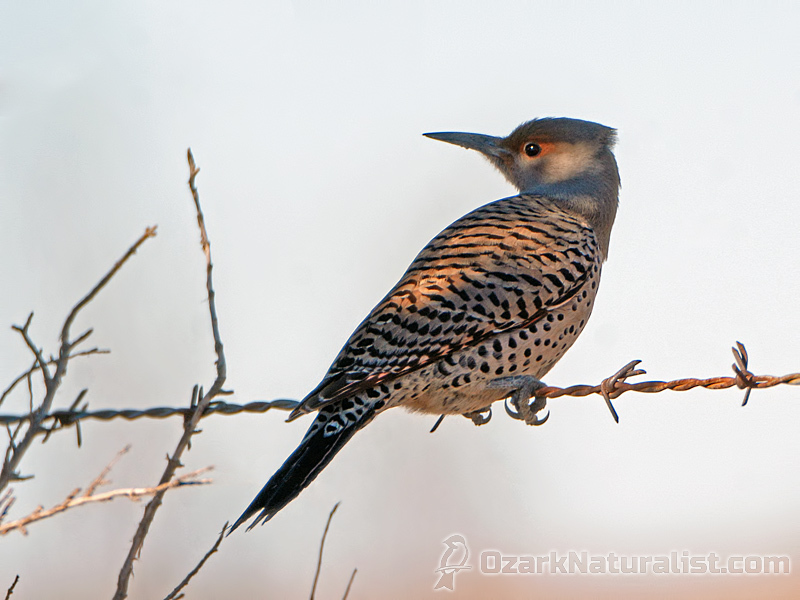 A small flock of Northern Flickers played keep away with us; as we got close, they would fly further down the fence line, never letting us close enough for photos. Finally, one landed on the barbed wire in the shade of an Eastern Redcedar. He apparently thought he was hidden because he finally stayed put for more than 3 seconds. The Flickers here were the Red-shafted variety instead of the Yellow-shafted we have in the Ozarks. The two were at one point considered separate species, but the powers that be lumped them together because they hybridise where the two populations meet. I think they had been lumped by the time I began birding—I remember people bellyaching because the lump had cost them a tick on their life list—so it’s been a while since they were separate. We were nearly back to Hwy 18, and while we had seen several Rough-legs, we still hadn’t really had a decent photography opportunity and we were starting to lose heart. Our despair was premature, for we soon spotted another hawk perched on a snag ahead of us. A quick look through the binoculars showed a Rough-leg, the first we’d seen perched instead of hover hunting. The bird was on the left side of the road and Brock was driving, so he got the first crack at him. 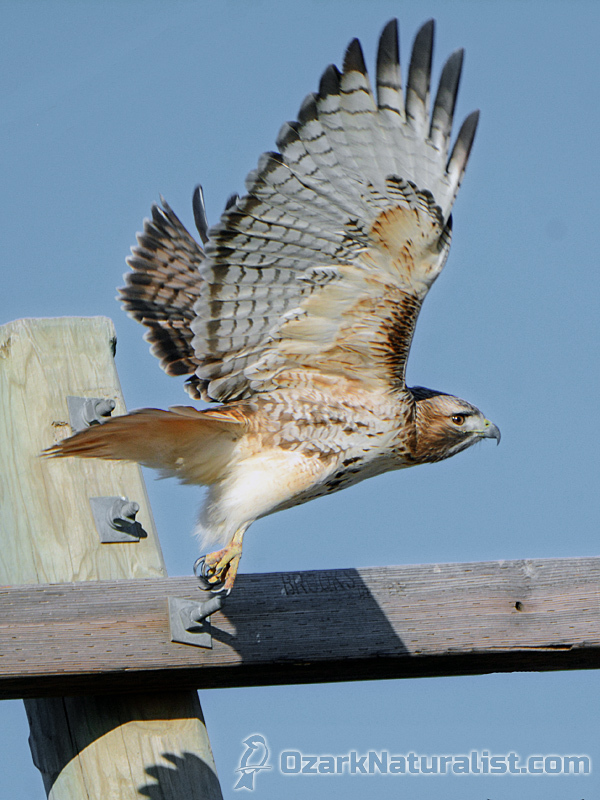 He got some decent shots before he flew, but I wasn’t so fortunate, trying to shoot through the windshield, a losing proposition if there ever was one. 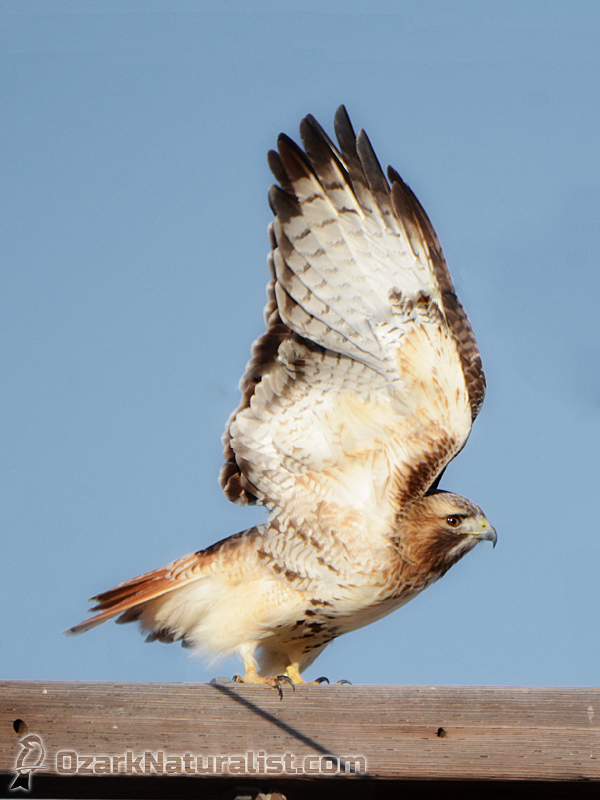 The bird soon grew nervous, abandoned his perch and flew right in front of me, crossing left to right before banking to circle behind me. 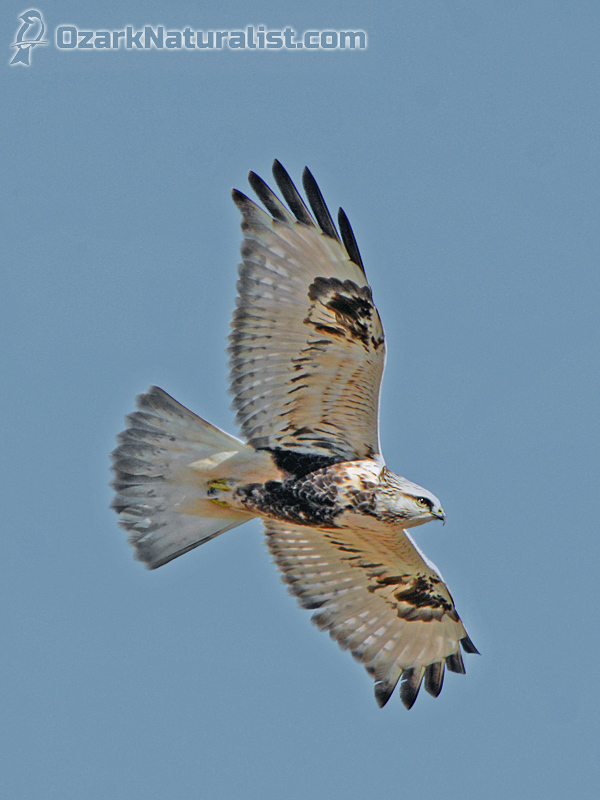 The indistinct terminal band on the tail and dark trailing edge of the wings mark this as a juvenile bird, though I can’t say whether it was male or female. and while I’m actually happy with these, this one was my favorite. This shot will soon be framed and hanging in my office at work. A 10×20 print should do the trick I think. We reached Hwy 18 a few minutes later and headed south back to Hwy 60. There were more Red-tails, Kestrels, Harriers and Meadowlarks (Eastern or Western? I don’t know. ), but no good photo opportunities, mainly because Hwy 18 has no shoulder safe to pull over on. We were on Hwy 60, almost back to Pawhuska and thinking it was about time to start the long drive home when we spotted a very dark hawk on a power pole. So one last time, we made a U-turn and headed back. 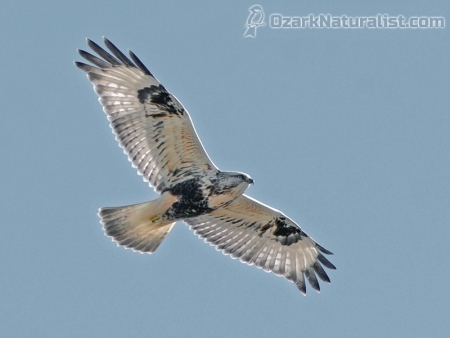 Brock pulled to the shoulder and I got off a few frames before the hawk bailed on us. I’m not sure what this bird is. 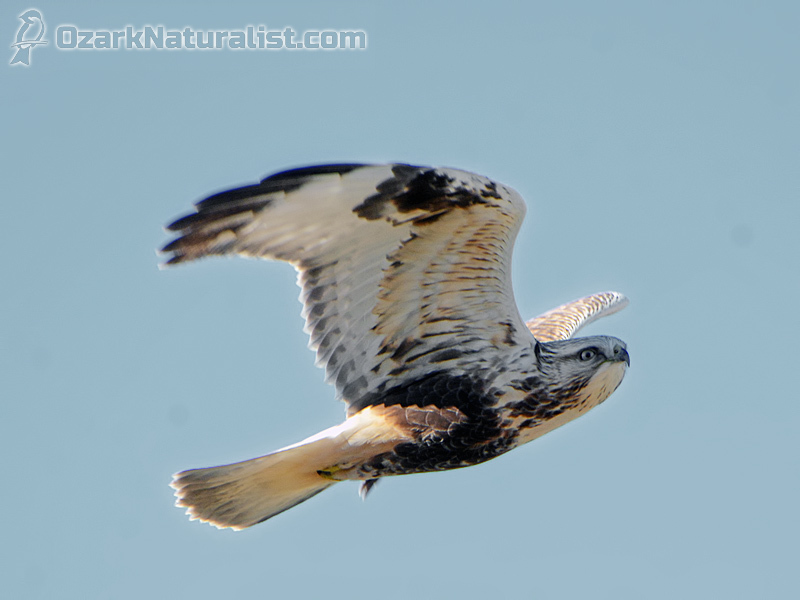 Both Red-tails and Rough-legs have a dark phase like this and it could have been either. If either the legs or tail was visible, I could probably say which. But they aren’t and I can’t. 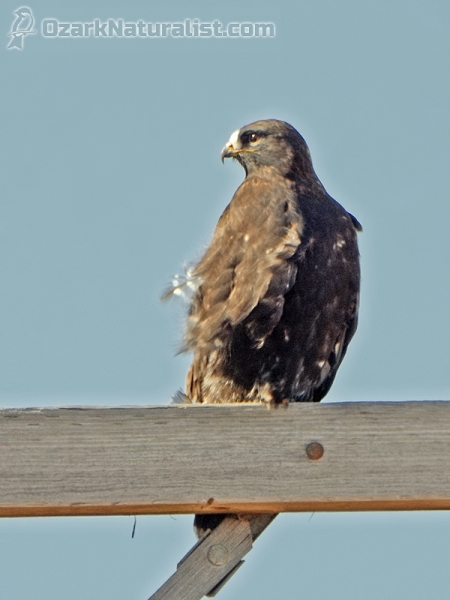 Rough-legs have proportionally smaller beaks than Red-tails and the beak on this bird looks small to me, but I’m not sure. Not enough to say it is a Rough-leg. On the other hand, he bailed mighty quickly on us and flew directly away from us, both of which are pretty typical of a Red-tail. From what I’ve read, Rough-legs aren’t as spooky, but as you know, I have virtually zero experience with them, so I’m not comfortable saying whether a Rough-legged would sit or scatter in that situation. Bottom line, I simply don’t know what species it was. And as much as that bugs me, there’s not a damned thing I can do about it. By this point, according to Google Maps, we had covered 82 miles since we had left Pawhuska earlier in the morning. We were both already getting tired and we had six more hours on the road to look forward to. So we gassed up the car, grabbed a bite to eat and headed back towards home. Other than me nearly running through the toll booth at the exit to I-44, it was an uneventful trip home. The Expedition was over and I’d call it a success. Now that I’ve been there and gotten a feel for the area,I want to go back and do it again.